Research shows that over three-quarters of shoppers choose to leave a site without completing a purchase. The decision to abandon a cart could be down to any number of things – from shipping costs and mobile experience to deciding to research more or perhaps even buy in-store. 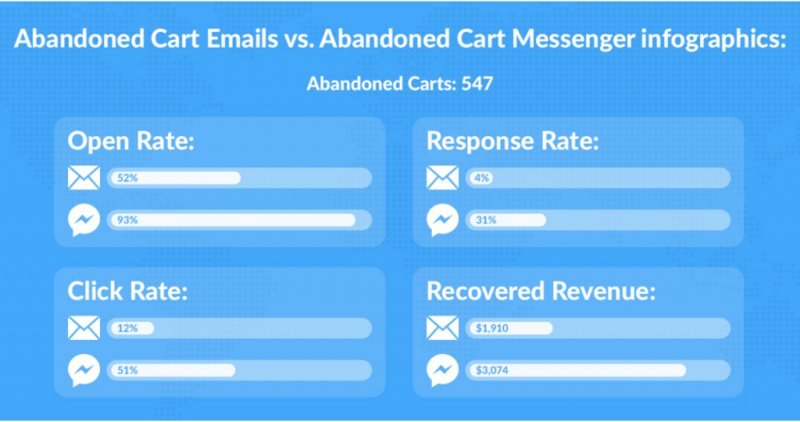 Regardless of the reason, abandoned carts equal lost revenue in every scenario. In this post, we look at four different ways that loyalty can help you stand your ground in the battle against cart abandonment, reducing your reliance on costly recovery techniques such as remarketing or discounts. One of the key benefits of a loyalty program is the revenue driven by fostering advocacy among your most loyal customers. Referrals are a big part of loyalty programs, and shoppers who are referred to a brand by their friends or family, are four times more likely to make a purchase. They are also between 16 and 24 percent more loyal and spend 200 percent more than the average customer. What does that have to do with cart abandonment? The higher the percentage of visitors that are coming to your site via referrals, the more qualified your web traffic will be. These customers are predisposed to your brand, having been recommended by someone that they trust. The risks associated with shopping with a new brand – not being sure of quality or perhaps wanting to shop around – are in many ways negated. Referred customers are therefore far more likely to complete their transactions without abandoning their baskets. Awarding points for referrals is a common component of loyalty programs. Organic cosmetic company, 100% Pure switch their referral feature on for limited time periods, launching email marketing campaigns each time referral rewards are possible to generate excitement and engagement. This tactic has proved hugely successful for them, generating over $244,000 in an 18 month period. However, not every visitor that is referred to your site will sail smoothly through the checkout. How can you make sure that referrals are getting you the right kind of traffic that is less likely to abandon their cart? Consider putting conditions on rewards, so that members can only collect their points once the person they refer has made a purchase. This will encourage members to send their referral codes to those they think are most likely to complete a transaction. You might also look to reward the new customer as well as the referring member, encouraging them to make that all-important first purchase. As well as rewarding referrals, loyalty programs commonly reward customers for positive behaviors such as leaving product or store reviews. 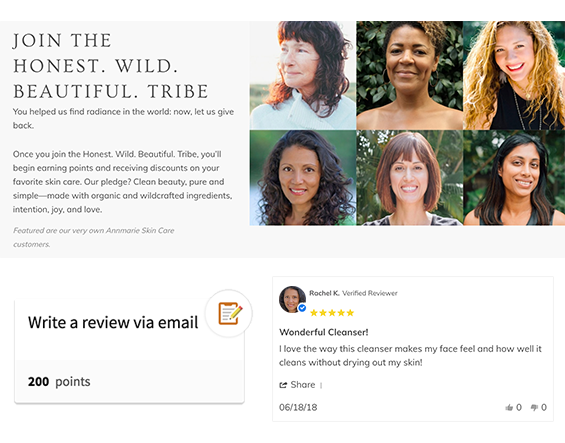 For example, Annmarie Skincare awards customers 200 points per review, generating over 1,000 reviews within the first three months of the program being live. The weight that social proof carries in everyday purchasing decisions is evident from the growth of brands using their Trustpilot rating as part of their advertising campaigns. However, with 74% of consumers identifying word-of-mouth as a key influencer in their purchasing decisions, social proof also has a big part to play in countering cart abandonment. Reviews are invaluable in encouraging customers to complete transactions, but they are also a powerful tool in recapturing those that don’t. 80 percent of customers indicate that they are more likely to do business with a company that offers personalized experiences. Use reviews that are specific to the product that a customer has left in their abandoned basket to create more targeted and personalized recovery messages that are more likely to bring shoppers back to complete their purchases. 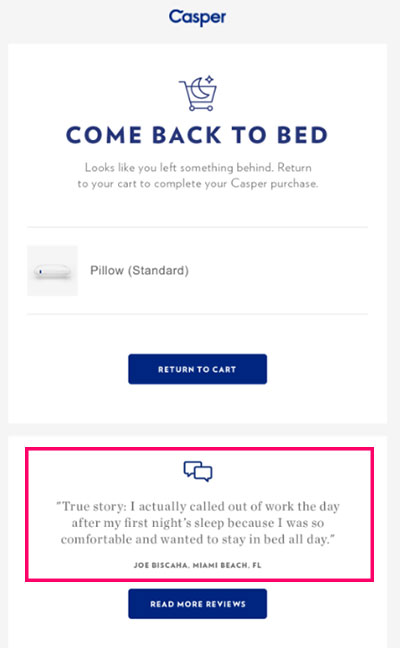 Mattress retailer Casper combines a comedic subject line with a customer testimonial to increase the effectiveness of their recovery messages. Recovery messages can be updated to promote social proof and positive reviews across any medium – from email or remarketing messages, to Messenger which is proven to have a 39% higher click rate, and a 27% higher response rate. When it comes to countering cart abandonment, the more insight you have into shoppers, the more effective your recovery campaigns will be. Customers who become members of your loyalty program rather than checking out as guests offer far more data on buying behaviors such as purchase frequency and average order value. With better insight into those buying behaviours, you will be able to identify when they deviate from their usual patterns. For example, consider a customer who adds an item to their basket that far exceeds their usual average order value, but then abandons their cart. Identifying that this purchase is out of the customer’s usual comfort zone is the first step. The second is looking at how you will use that information to encourage them to return and complete the transaction. Tailoring your recovery message to include an incentive to return and complete their transaction is key. By showing the customer that you know them and you understand that this is a big purchase for them you are building the trust they require to come back and take the plunge. Offering them something such as double or bonus points on that purchase could be the thing that tips them across the line to make the transaction. First-time buyers are not the only ones to abandon their carts, however, a first-time purchaser who joins a loyalty program spends 40% more than a customer who doesn’t. This makes it even more important to try and avoid cart abandonment at this early stage of a customer’s journey. Offering points or rewards for account creation, or for completion of the first purchase vastly increases the chances of a customer completing the purchase without abandoning their cart. The key to this, is ensuring that the reward that you offer at this stage will make a significant impact on their next purchase. 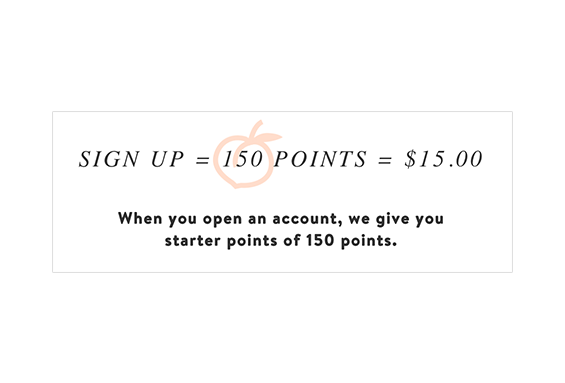 For example, beauty brand Peach and Lily awards customers 150 points – the equivalent of $15 – for creating an account. As members can redeem points for rewards as soon as they accumulate 100 points, customers see the benefit of joining the program almost immediately. The battle against cart abandonment is one that retailers will continue to face, but your loyalty program could be the key to encouraging customers to complete transactions more cost-effectively. We’d love to hear from anyone who’s testing these techniques!